My wife and I traveled to Washington D.C. in July 2004. On our way, we stopped in Shanksville, PA and visited the site of the crash of United 93. This was such a powerful place to visit. Very quite and calm. It was very windy that evening and the only sounds you could hear were the flags blowing the the tokens clanging on the memorial fence. 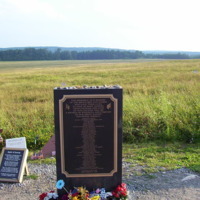 This picture is of the memorial stone looking out into that peaceful looking but hollowed ground where the plane came to its final resting place. God Bless those HEROS of United 93! “3100.pjpeg,” September 11 Digital Archive, accessed April 21, 2019, http://911digitalarchive.org/items/show/33638.